THE TUBE TICKET HALL AT 1045 A.M.
Telephone the week before to confirm numbers. 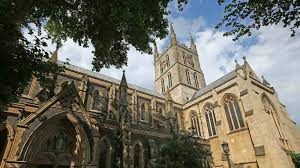 The Cathedral and Collegiate Church of St Saviour and St Mary Overie stands at the oldest crossing-point of the River Thames at what was for many centuries the only entrance to the City of London situated across the river. During the building’s life as St Mary Overie, the priory was under the control of the Diocese of Winchester which meant that many of the powerful Bishops of Winchester were involved in shaping the building and what happened in it. At the Dissolution of the Monasteries in 1539, the last six canons were pensioned off although they continued to live in buildings north of the church. The church itself became the property of King Henry VIII who rented it to the congregation. It was re-named St Saviour’s, though the old name remained in popular usage for many years. Tired of renting from the King, a group of merchants from the congregation, known as ‘the Bargainers’, bought the church from King James I in 1611 for £800. It was during this time that the church became the stage for many of those involved in the theatres of Shakespeare’s day. By the mid-19th century, living and working conditions in south London were intolerable. They were depicted by novelist Charles Dickens in distressing detail and by Charles Booth’s social researches with grim accuracy. It was proposed that a new diocese should be created and in anticipation for this a new nave was designed by Sir Arthur Blomfield in 1895. St Saviour’s Church became Southwark Cathedral in 1905. The diocese which it serves stretches from Kingston-upon-Thames in the west to Thamesmead in the east and Gatwick Airport in the south. It has a population of two-and-a-half million people, served by over 300 parishes. We have arranged a guided tour for members to TWO TEMPLE PLACE on Friday 6 April at 1100. 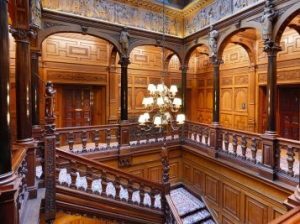 Two Temple Place is one of London’s architectural gems, an extraordinary late Victorian mansion built by William Waldorf Astor on the Embankment. This is one of London’s most prestigious venues, dedicated to promoting culture and philanthropy and we will have a tour of the building. In addition you will have free access to the current exhibition which is called “The Age of Jazz in Britain”. We will meet at Temple Tube Station at 1045 and walk to the venue. The price will be £11 in cash on the day please. Pease let Peter Hounsell (peter.hounsell@btinternet.com) know if you wish to attend. Today the Charterhouse is home to a community of Brothers who benefit from the charity established by Thomas Sutton early in the seventeenth century. The story begins in 1348 during the Black Death, when the land was used as a burial ground for victims of plague. In 1371, the Charterhouse was built – a Carthusian monastery, which flourished throughout the later medieval and early Tudor period. With the dissolution of the monasteries, the Charterhouse became a mansion for wealthy noblemen and a refuge for royalty. Thomas Sutton bought the Charterhouse and established the foundation that now bears his name. His will provided for up to 80 Brothers: ‘either decrepit or old captaynes either at sea or at land, maimed or disabled soldiers, merchants fallen on hard times, those ruined by shipwreck of other calamity’ as well as Charterhouse school. When the school moved to Godalming in 1872, the Brothers remained at the Charterhouse in Clerkenwell. On our weekend abroad this year we are visiting three royal chateaux in Northern France at Chantilly, Compiegne and Pierrefonds . We travel by our private coach throughout, leaving from Ealing Broadway at 08.15 on Thursday 26 May, crossing the Channel on the 11.10 ferry from Dover to arrive Calais at 13.40 local time for our onward to our hotel, the 3* Mercure Compiegne Sud, where we will stay on a bed, breakfast and evening meal basis throughout. On Sunday 29 May we will leave the hotel at 09.00 with a break at Arras en route to Calais for our return ferry departure at 16.05, expecting to arrive back at Ealing around 19.00 (BST). On the Friday we will explore the chateau of Compiegne in its grounds and make the short trip to Pierrefonds later in the day before returning to our hotel. On Saturday we will have a full day at Chantilly to visit the chateau including its celebrated art gallery and grounds. The cost of the weekend will be £455 per person sharing a twin-bedded room with a single supplement of £90 (ie £30 per person per night). The cost will include the coach travel, the hotel accommodation as specified and entrance fees to the properties. 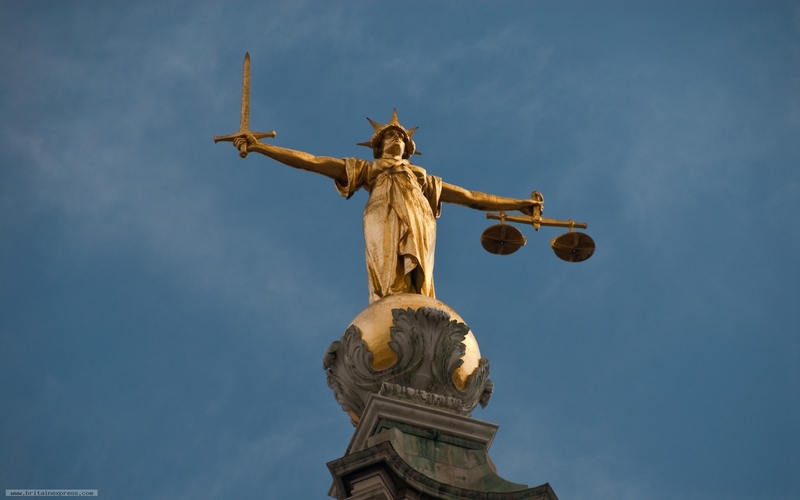 Please note that travel insurance is not included and travellers are strongly advised to make their own insurance arrangements. Our travel agents will be Golden Compass whom we have used successfully on previous trips. If you wish to join us please complete and return the tear-off slip below and return it to me together with a deposit cheque for £100 per person made out to ‘Golden Compass Trust Account’. Bookings should be with me not later than 15 February 2016. I will then need the balance due (by cheque as above) not later than 12 April 2016. I enclose my cheque for £……. (at £100 per person) made out to ‘Golden Compass Trust Account’ by way of deposit. Here are the details our visit to the Central Criminal Court at Old Bailey. 1½ hours. We must meet at the Lord Mayor’s entrance in Warwick Square which is round the back of the main building. The best way from Ealing is to take Central Line Underground to St. Pauls Station. Turn left ( west ) out of the station walk approx. 300m and turn left into Warwick Lane . Warwick Square is a short side street on the right. I quote from our host “ The visit is free but It is customary for visitors to make a donation of £15 each to the Sherrifs’ and Recorders’ Fund”. If this causes difficulties I am sure this will be understood . I will collect donations when we meet. I hope you enjoy the visit. There are some 25 people in the group, I hope the same number emerge as went it. If you get separated, just remember not to admit anything! Our autumn visit will take us to the Alexander Fleming Museum at St Mary’s Hospital, Paddington on Friday 23 October 2015. We meet at 10 am by the new taxi rank at Paddington Station and begin our morning with a stroll round the Paddington Canal Basin (‘Little Venice’) led by our chairman Peter Hounsell before going on to the museum. There, our visit will include a short talk and film and we will also see the reconstructed lab where Fleming discovered penicillin. The visit should end around 12 to 12.30. (We are advised that the museum visit involves some stairs as there is no lift.) The cost of the morning is £4 per head and if you would like to join us please get in touch beforehand with Colin Emmins on colin.emmins@btinternet.com. Spencer Williams, a local blue badge guide, will guide us around Bunhill Fields burial ground and Wesley’s House and the Museum of Methodism in the City Road on Saturday 7 March. We’ll meet at Old Street station (City branch of the Northern Line) at 10.30 am. Cost £10 per head payable on the day. As the burial ground authorities limit groups to a maximum of 10, those interested are requested to book early and also to be sure to let us know if they have subsequently to drop out in case we have a waiting list. Antwerp is a hidden Flemish gem. Its medieval streets, Renaissance monuments and lively atmosphere tend to be overshadowed by it being known as the world’s fifth-largest port and centre of the diamond trade. You can see thousands of Old Masters at the Royal Museum and Rubens House. There is the lively Grote Markt, and the fascinating museum of printing, Plantin-Moretus, which is a UNESCO World Heritage site. There is also the still unfinished Cathedral of Our Lady, started in 1351, with its Rubens masterpieces. 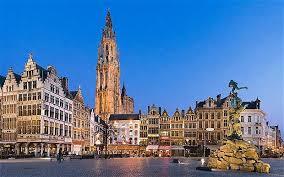 Through the travel firm Golden Compass we have arranged a very interesting and reasonably priced trip to Antwerp. We will stay at the Central Hotel, Antwerp, a three star hotel right opposite the central station with meals taken in its restaurant: b & b plus two dinners, with half day walking tour of the city with guide on the Saturday morning. Going out on the Friday: St Pancras 10.58 – Brussels arr 1405 dep 14.27 – Antwerp arr 15.21; returning on the Monday Antwerp 14.24 – Brussels arr 15.10 dep 15.56 – arr St Pancras 16.57.